Why is Oakton, VA #36 in the Top 100 Places to Live? Money magazine recently published an article called “Best Places to Live: Money’s list of America’s best small towns.” In it, Oakton, Virginia ranked # 36 of the Top 100. It’s interesting that Money chose to catalog Oakton as a “small town”. Sure, it’s a nice, mostly residential area with a farm and equestrian history which gives it a character of its own, but in reality, Oakton,VA is not exactly a town. Google’s definition of a town is: “An urban area that has a name, defined boundaries, and local government”. Based on this definition, what Oakton lacks to be a town is a local government. If Oakton isn’t a town, then what is it? Oakton, VA is part of Fairfax County, a suburb of Washington, D.C. It has been designated as a “Census Designated Place (CDP)”, with its own zip code (22124). However, if you were to ask a resident of Fairfax County where exactly does Oakton start and end, you’d get differing answers with some including areas in nearby Vienna as well. 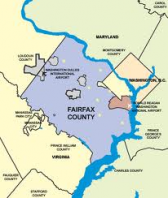 Below is a map with the location of Oakton in the middle of Fairfax County, to the West of Washington, D.C. Notice that the 22124 zip code area is somewhat different than the “Oakton, VA” area… interesting, eh? Ultimately,Oakton is a beautiful area with many good characteristics but it’s definitely well blended into Fairfax County. One of the good characteristics of Oakton is that its schools are highly rated. Fairfax County Public Schools are ranked in the top 6% in the entire US. And the schools which serve Oakton (and nearby areas) are further highly ranked among Fairfax County schools. Below is a list of Fairfax County high schools that serve the Oakton area. Keep in mind that each of these school’s attendance areas also stretch to nearby areas such as Fairfax, Vienna, and Reston. This can give you a good idea of how Oakton blends in with neighboring areas within the County. On top of having great schools, Oakton is well located within the County. People who live near Oakton’s south-east end can walk to the last stop of the Orange Metro line, Vienna, which goes into Washington, D.C.. Being able to walk to the Metro stop can be very convenient for commuting into work. For people driving to work in the city, there is easy access to the famous Route 66 – which is the most direct way to get into DC. While Oakton is well located to access D.C., Oakton is also close to Reston, Vienna, and Tysons Corner – all great places for working, shopping, and having fun. At the Oakton shopping center, there’s a grocery store, a coffee store, a bank, and several specialty stores. But having only one shopping center is not a problem because just down the road, the Town of Vienna has a long main street (Maple St.) full of all kinds of places to shop. 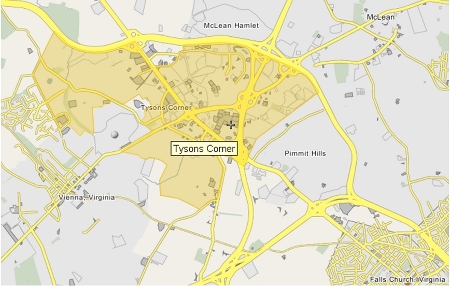 And one of the largest shopping malls is only a few miles away in Tysons Corner. So you think you would like living in Oakton? The average dwelling in Oakton is a single family house set in a lot of about 1/2 acre to 2+ acres. Aside from the single family homes, there are also some townhomes and condos on the south-east end, near the Metro. Something cool about this area is that, because of its farming and equestrian beginnings, there are still plenty of lots that allow horses, plus there are trails throughought for horse riders. People who live in Oakton appreciate the wooded feeling of it, the rolling hills, and the access to many creeks, natural parks and even the W&OD trail for biking or walking. In conclusion, Oakton, VA is a great area to live in if you are looking for a suburban lifestyle where you can enjoy the natural surroundings. Money magazine had it right after all. Do you have any questions about Oakton? Post them below – we’d love to hear from you.